A simple subungual hematoma is not an indication to remove the nail. Trephination is not indicated if the hematoma encompasses only 25%, there is no significant pain, or if injury was over 24 hours ago, as the blood likely clotted and will not flow out. Blood under the cuticle proximal to the nail is a clue that there is a deeper injury and usually the nail should be removed if there is significant pain. There is controversy regarding treatment of subungual hematomas and whether simple trephination is enough or whether inspection of the nail bed for injury is required. It was suggested that for subungual hematomas involving more than 50% of the nail bed, the nail should be removed given the risk of nail bed laceration. This study did not follow up with patients and did not have a control group, so long term outcomes are unknown. However, subsequent studies have shown that if there is no other significant finger tip injury, treatment by trephinating alone provides a similar good cosmetic and functional result. If you don’t have a trephinator, what else can you use? 23-gauge 1-inch needle: Hold the needle over the hematoma, avoiding the lunula, twist and rotate the needle back and forth like a drill; no pressure needed. What if there is a fracture underneath? Though there is a risk of turning the fracture into an open fracture, consider still performing the procedure if the injury is painful. You can consider antibiotics if trephination is pursued, though there is no data. It is always important to obtain an x-ray with any traumatic injury. Suture the nail bed if a large subungual hematoma is associated with an unstable or avulsed nail. 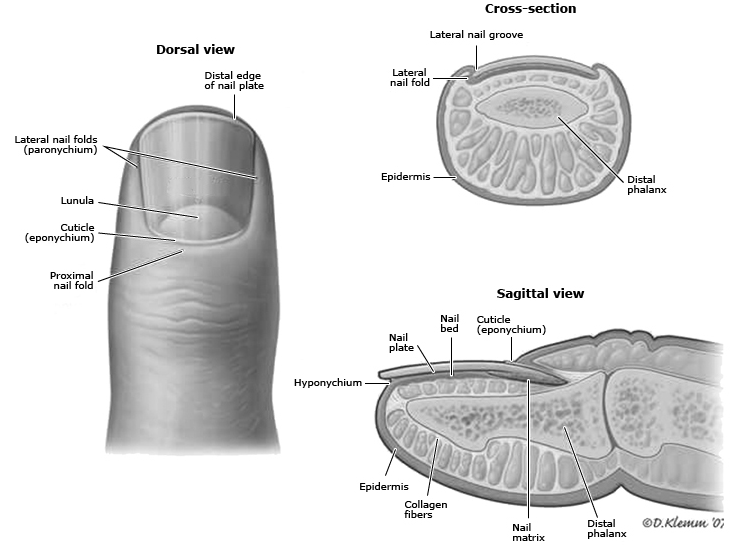 Good outcome depends on maintaining the space under the cuticle where the new nail will grow out from (the germinal matrix). If this area scars down a new nail will not grow. If the nail is only partially avulsed or loose, especially at the base, lift the nail slightly to assess the nail bed. If the nail is completely transected, it is best to remove the entire nail to suture the nail bed. In this case, suture the proximal and lateral nail folds first for better approximation prior to repairing the actual nail bed. A sturdy needle (3-0 or 4-0) is needed to suture the nail back in place. Before replacing the nail and suturing it back in place, you can poke a hole through so the needle and suture can pass more easily. Protecting the exposed nail bed is essential, which can be done with the nail itself (wash well beforehand with normal saline), with the sterile aluminum foil from the suture pack, or with a piece of vaseline gauze. The nail should be reinserted under the eponychium to protect the open space for nail growth. Consider a hand surgeon consult if the nail bed is extensively lacerated or if part of the nail bed is lost, as the patient my need a matrix graft. Tell the patient to return for a wound check 3-5 days post repair. Replace any non-adherent material that was inserted into the proximal nail fold. Afterwards, the patient should perform dressing changes every 3-5 days. Sutures that were used to reattach the nail should be removed in 2 weeks. Nails grow at a rate of 0.1 mm/day and it takes approximately 6 months for a new nail to grow. Instruct the patient to avoid any trauma or chemical irritants to the healing nail. Dr Ahlzadeh has presented a nice review of the approach to nail trauma and some useful techniques. While there are seldom formal lectures during residency training dedicated to nail trauma, it is something we regularly see and treat in the ED, so it is important that we do this well. It is well within the scope of practice of Emergency Medicine to be the primary providers for most nail injuries. Today it seems the tide has turned. It is now well accepted practice to leave a nail in place in the setting of a subungual hematoma as long as the nail is intact and laying flat on the nailbed, regardless of the percentage size of the hematoma. This makes intuitive sense. An anatomically intact nail lying flat upon the nailbed should lead to the flat healing of an underlying laceration. A common practice to ensure that the nail remains flat after discharge is to trephinate nail so that pressure from the underlying hematoma does not elevate the nail off of the nailbed after discharge. Nail trephination is one of the more rewarding procedures in Emergency Medicine. Patients present with throbbing pressure from the tense subungual hematoma and typically get immediate improvement once the nail is trephinated. Many techniques have been described. Dr Ahlzadeh even refers to a “trephinator”. I am not actually sure what this device even is. Regardless, this procedure should be quick and easy. No anesthesia is necessary. I suggest keeping it simple. Rather than heating a needle or paper clip, use a cautery device. In our ED we have a cordless disposable plastic cautery device that is the size of a magic marker. It has a single button and the tip becomes orange with heat when the button is pressed so you know it is hot and ready to go. Warn the patient that they will feel some heat and possibly see or smell a bit of smoke but it will be brief and not painful (unless you are too forceful, in which case it will be hot and painful!). Pick the location in the center of the hematoma. Repeatedly very lightly touch the hot cautery tip to the nail over the center of the hematoma until you are through the nail. You will know you are through when a drop of blood comes out of the hole you have trephinated. At that point you can stop and gently express whatever blood you can. That’s the whole procedure. It should take mere seconds. When the patient gets over the initial anxiety of the procedure they typically realize they feel better. 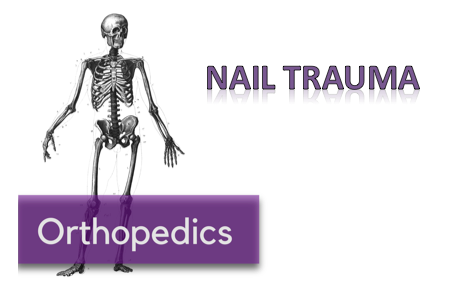 Nails that are deformed or elevated off of the nail bed are not good candidates for trephination. These nails should be removed for nailbed repair so that the nailbed heals flat. Don’t even bother unless your digital block is highly effective. We do not have commercial finger tourniquets in our ED so I like to make my own professional looking tourniquet. I get a sterile glove is about the size (or a half size smaller) than would fit the patient. I cut the very tip off the finger of the glove that corresponds with the patient’s injured finger. Then I put the glove on the patient and roll the cut glove finger proximally and voila, you have both a tourniquet and a clean field. Now you are ready to get comfy and repair the nail bed according to Dr Ahlzadeh’s techniques! While a sturdy needle is needed to puncture through a nail, I still find the nail often deforms the needle. So instead of piercing the nail with my needle, I once again use my trusty cautery device to make holes in the nail that my needle will easily pass through without deformity. [Peer-Reviewed, Web Publication] Alzadeh G, Kenny J (2018, April 8). Nail Trauma. [NUEM Blog. Expert Commentary by Levine M ]. Retrieved from http://www.nuemblog.com/blog/nail-trauma. Batrick N. Treatment of uncomplicated subungual hematoma. Emerg Med J 2003;20:65. Guthrie, Kane. “Minor Injuries 001.” Life in the Fastlane. <http://lifeinthefastlane.com/minor-injuries-001/>. Hedges, Jerris, James Robers. “Methods of Wound Closure.” Clinical Procedures in Emergency Medicine, 6th ed. Philadelphia: Elsevier/Saunders, 2014. Roser SE, Gellman H. Comparison of nail bed repair versus nail trephination for subungual hematomas in children. J Hand Surg [Am]1999;24:1166–70. Strauss E, Weil W, Jordan C, Paksima N. A prospective, randomized, controlled trial of 2-octylcyanoacrylate versus suture repair for nail bed injuries. J Hand Surg Am. 2008;33(2):250-253. Posted on April 9, 2018 by NUEM Blog and filed under Orthopedics and tagged nail trauma subungual hematoma trephination nail repair nail bed injury nail bed laceration.